"Fish out of water...Surfers in Yellowstone"
Meet the Deedles is an over the top comedy film in the vein of other Disney produced family friendly live action films. 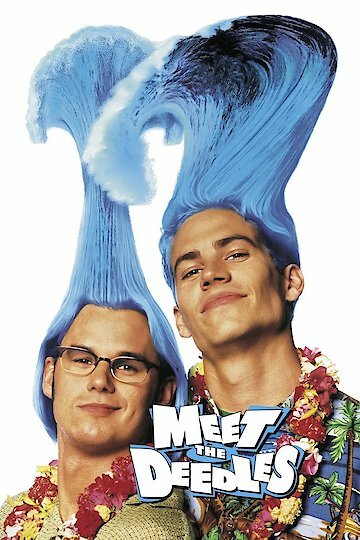 In the film, the Deedle brothers, Stew and Phil, played by Steve Van Wormer and Paul Walker respectively, are two surfers who, on their 18th birthday decide to skip school to celebrate and are finally expelled which only serves to further enrage their wealthy father Elton, played by Eric Braeden of soap opera fame. After their father sends the boys off to boot camp, a few strange twists land the two brothers in immediate hot water. Waking up in the clothes of two recently hired female park rangers Mel and Mo, the boys decide to roll with it and take up jobs at Yellowstone National Park where they quickly find themselves embroiled with a former ranger out for revenge. The antagonists are played by Dennis Hopper, Robert Englund and Richard Lineback as the disgraced former ranger his henchmen Nemo and Crabbe, lending their incredible talents for playing humorous and sinister villains. Together the three hatch a plot to utilize the prairie dog infestation to redirect Old Faithful to a new theme park. As soon as the brothers discover the sinister plot to change Yellowstone park forever, they themselves are discovered when Mel and Mo finally arrive at the ranger base. Meet the Deedles was directed by Steve Boyum and written by Jim Herzfeld. It was produced by DiC, Peak Productions and Walt Disney Pictures. It was distributed by Walt Disney Studios Home Entertainment. Meet the Deedles is currently available to watch and stream, buy on demand at Amazon, Vudu, Google Play, FandangoNow, iTunes, YouTube VOD online.